On Wednesday October 7th 1829, Sam Patch became the first daredevil to challenge the Niagara River. The 22 year old from Rhode Island dove into the churning waters of the Niagara River from a height of 26 metres. Mr. Patch chose the location of Goat Island to build his diving platform. He survived this headfirst high dive unharmed. Only 10 days later Patch made the second successful high dive at the falls from a height of 40 metres. On August 27th 1856, E. Jackson successfully swam in the Niagara River from the Bridle Stairway (Goat Island) to the Horseshoe Falls. On August 25th 1869, J.F. "Professor" Jenkins crossed the Niagara Gorge on a tightrope located at the Whirlpool Rapids just north of the Railway Suspension Bridge. Professor Jenkins rode across on a combination bicycle – velocipede. On August 10th 1881, David McDowell walked across the Niagara Gorge, intoxicated, on the narrow railing of the Upper Suspension Bridge. On August 25th 1882, Frank M. Brown swam across the Niagara River from the foot of the American Falls to the Canadian shoreline in 4 minutes and 46 seconds. In 1887, Clifford Calverly came to Niagara Falls to perform his tight rope act. He set a speed record by crossing the gorge in two minutes and thirty-two seconds as compared to the usual fifteen to twenty minutes required by most of his predecessors. During subsequent crossings, Calverly skipped rope, hung by one arm, hung by one foot, sat on a chair and used a wheelbarrow. Charles Percy was the first person to actually ride the rapids in a 5.2 metre long boat in August 1887. He made three trips through the rapids in 1887. On Percy’s last trip he narrowly escaped death and his boat sank. On September 6th 1890, Samuel Dixon crossed the Niagara River gorge using a rope with a diameter measuring 7/8 of an inch. This rope was stretched across the gorge over the wildest part of the Whirlpool Rapids. On the return he added more suspense by lying on the rope with the pole resting on his chest, standing on one foot and by hanging from the rope with one hand. James E. Hardy came to Niagara Falls in the summer of 1896. At the age of 21, Hardy was the youngest person ever to tight rope walk across the Niagara River gorge. In this summer Hardy made sixteen crossings. Oliver Hilton was a professional circus rope walker. Hilton claims to have crossed the Niagara River gorge at the age of 10, on September 16th 1897, on the rope that James E. Hardy had left behind. No proof exists to support this claim. On August 22nd 1886, Carlisle Graham had offered $10 to anyone willing to retrieve his barrel from the Whirlpool. James Scott agreed to Graham’s offer and, while awaiting Grahams return, Scott made a practice jump into the water and died of drowning. On November 7th 1886, Lawrence Donovan jumped into the Niagara River from the Upper Suspension Bridge while wearing a suit, canvas shoes and a bowler hat. On December 15th 1886, Alphonse "Professor" King walked 30.5 meters on the Niagara River near the Canadian shoreline while wearing a pair of tin shoes. King called his shoes "Golden Fish". This stunt took place at the Upper Suspension Bridge. 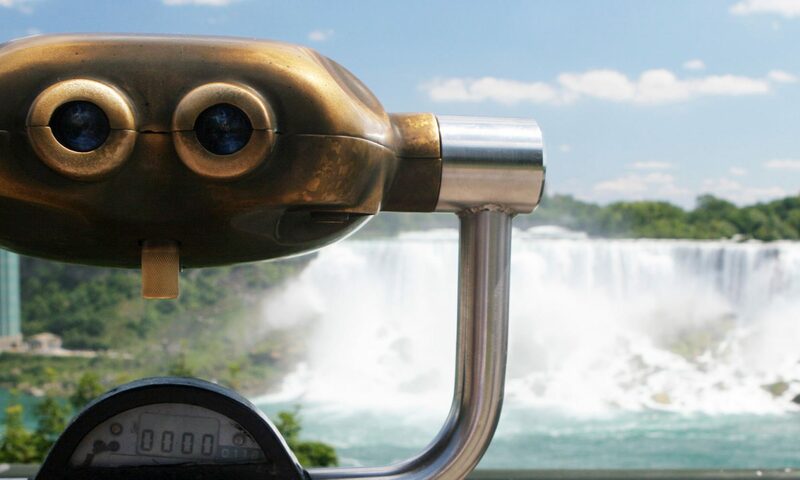 On August 14th 1887, Alphonse King crossed the Niagara River below the Horseshoe Falls on a water bicycle. The modified bicycle consisted of a wheel with paddles erected between two water tight cylinders, each 20 cm in diameter and 3m long. On September 16th 1888, Percy again successfully navigated the Whirlpool Rapids in his boat. On this trip, Percy successfully crossed the Whirlpool and continued his trip through the Great Gorge Rapids on route to Lewiston. As Percy was passing the Niagara Glen area, he was tossed out of his boat. Since Percy was wearing a life preserver, he was able to float the remaining distance to Lewiston, New York. On July 4th 1888, Robert Flack was drowned while attempting to navigate the Whirlpool Rapids in a boat. Flack was using a self described "secret" buoyant filling which turned out to be wood shavings. Flack had secured himself into his boat by a number of harnesses. Unfortunately, Flack’s boat over turned and Flack was unable to free himself before drowning.